This post was going to go up on Friday last week, but obviously there was more going on in the world. I wanted to give current events some space and time – I was mostly unplugged over the weekend myself. It’s been hard for me to focus on the holidays this year with Baby Countdown at about 8 weeks. That said, there are some things I got for people I love, and things I wouldn’t mind receiving myself! Hanukkah is already over. But as my mother always says, there are 12 days of Christmas. No partridge in a pear tree here, but I’ll have a few suggestions over the next 3 days. My husband has semi-forbidden me from buying more cookbooks. Here are a few that I have (or Santa is bringing me!). Ripe: A Fresh, Colorful Approach to Fruits and Vegetables by Cheryl Sternman Rule and Paulette Phlipot. The visually striking book is arranged by color and, in addition to delicious recipes, offers general preparation suggestions for each fruit or vegetable. Also happens to be vegetarian. When I gave my sister-in-law a copy earlier this year, her 5-year-old had me read it to her before dinner. She requested more of it as her bedtime story that night and informed her mom that there were several recipes they needed to try. Plenty: Vibrant Recipes from London’s Ottolenghi by Yotam Ottolenghi. A vegetarian cookbook by a non-vegetarian chef, I get hungry just browsing the table of contents. Creative plant-centered dishes with Middle Eastern-leaning spice profiles that are sure to please. Could be a little heavy on the cheese for some. I’m also looking forward to checking out Ottolenghi’s newest cookbook, Jerusalem, also published this year. I don’t actually own this book yet, but it mysteriously vanished from my Amazon wishlist. I can’t wait to see it since Sara’s blog is a beautiful ode to fresh fare. I always get ideas from her creative use of seasonal produce. The Smitten Kitchen Cookbook by Deb Perelmen. Another one I don’t have yet, but has great reviews. I cook from her blog frequently and always enjoy her writing. Super Natural Every Day: Well-Loved Recipes from My Natural Foods Kitchen by Heidi Swanson. I bought this when it was published earlier this year. I love how Heidi presents an approachable, almost nonchalant way of eating seasonal, healthy vegetarian fare that doesn’t skimp on flavor or creativity. Pair it with her first book, Super Natural Cooking: Five Delicious Ways to Incorporate Whole and Natural Foods into Your Cooking, as a bonus! Many bloggers and chefs had cookbooks come out this year. 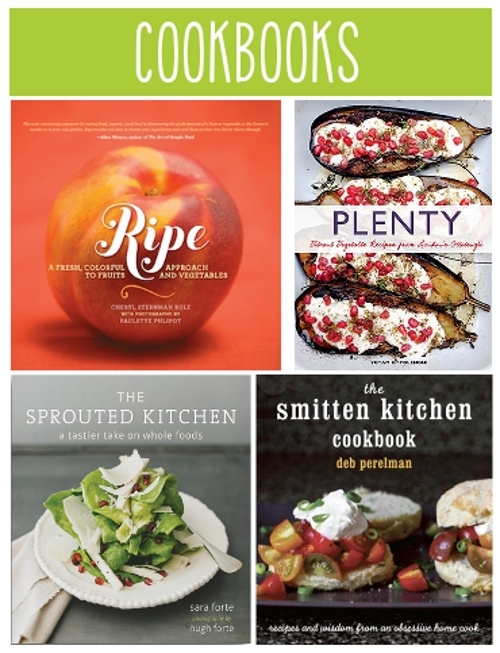 Any other new cookbooks you love? Leave a comment below with your suggestions (or wish list!). I’d love to hear what you’re cooking from. That’s funny – I have the books on this list that you don’t, and you have the books on this list that I don’t! I’ve had my eye on Plenty for a while now. The SK cookbook is pretty much exactly what you’d expect – very similar to the website; in other words, I love it. I like The Sprouted Kitchen, but you’ll probably get more out of it than I did, being from California like the author. For me, there was too many specialized ingredients I can’t find where I live, like Tuscan kale and Meyer lemons. That is funny! And that’s what I am excited for with the Sprouted Kitchen book – she lives about 90 miles from here so I anticipate seasonal overlap. I confess – the grocery store here started carrying Tuscan kale about a month after I got The Sprouted Kitchen. I guess it was more the insistence to use somewhat specialized ingredients that rubbed me wrong. I can’t believe people steal lemons from other people’s trees! The nerve! Fair. I’m sure I’ll pay more attention to that, now. I’m pretty laissez-faire about substitutions, especially when it comes to greens (though there are cases where Tuscan kale is legitimately the best choice…). It’s tough with so many good blogs out there, and I tend to use cookbooks for inspiration more than the recipes anyway. But I still love flipping through them and getting ideas!